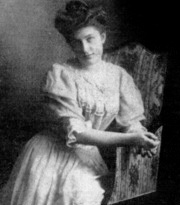 Butkovsky had been fascinated with occult subjects ever since reading Mme Blavatsky's The Secret Doctrine at an early age.6 In 19167 she attended her first Theosophical Society meeting in St. Petersburg, where she met P. D. Ouspensky. She was aware of who he was because she had read his book, Tertium Organum, which had been published in 1912.8 She and Ouspensky immediately became friends and spent considerable time together. She stayed with Gurdjieff until August 1917, when the revolution forced Gurdjieff to leave for Essentuki. Prior to that time, Ouspensky had replaced her in his affections with Sophie Grigorievna Volochine, who later became Mme Ouspensky. 1. Anna Butkovsky-Hewitt, with Mary Cosh and Alicia Street, With Gurdjieff in St. Petersburg and Paris (New York: Samuel Weiser, 1978), viii-ix. 7. William Patrick Patterson, Struggle of the Magicians (Fairfax, CA: Arete Communications, 1998), 23. Butkovsky-Hewitt says 1916 in her book, but Patterson writes that Ouspensky met Gurdjieff in the autumn of 1915 and Ouspensky already knew Butkovsky-Hewitt at that time.